Summer driving season is coming. Of course, gas prices are going to go up. The point I was trying to make is that getting caught up in anticipating the routine to happen in the face of the changes that are happening could be a recipe for disaster over time. In any one year the move from ICE to electric doesn't seem like much. Climate change doesn't seem like much, as far as that goes. But at some point the average person will wake up and find that their choices have become predominantly electric. Even the vaunted big trucks will go that way, eventually. Semis, perhaps strangely, look more poised than one ton work trucks to adapt more quickly. But does this gradual change mean that the markets will respond with the initiative to build the infrastructure necessary to thrive in the electric paradigm, or will it propel us into a sort of quasi third world situation? Even oil didn't succeed overnight, even though looking at its success in the rearview mirror makes it look that way. People like Churchill came along, and moved the Royal Navy to oil all at once. He could see that a piecemeal approach, what the markets left to themselves would do, was the wrong approach. And he wasn't under the gun of the old resource depleting. There's going to be a major problem recharging electric vehicles once they penetrate to a certain level of total vehicle ownership. I was just reading yesterday about some new battery innovation, some German company called Innolith, that promises a 600 mile range. But it still takes all night to recharge that battery. The other day I also read some story written by a pro electric writer, who cited the lack of places to charge - and laid the responsibility to put more charging stations out there upon the electric car companies. Really, the electric car companies are going to build the spine that makes it possible for electric cars to penetrate beyond a certain meager level? Those things can't just be placed out there so that people who have garages at home, where they normally charge, can also charge when they go on the road. They have to be all throughout the more thorny neighborhoods, and integrated into all of those huge apartment complexes, or adoption will never get to the necessary point. How far do people who flippantly declare that stations will appear think that your average overweight American will be willing to walk to their charged car? Maybe it will drive to them, but maybe it won't! One thing's for sure, the current Administration will be no help with that. There are about 40 years left of gasoline driven cars. That doesn't mean that we can waste another 4 of them comfortably wallowing in pity over the demise of the American dominance of the past. That sort of thing only leads to people parking their pickup trucks in front of the few charging stations that do exist, and thinking they are doing society some kind of favor. Of course, America can still dominate the future if it does waste those 4 years, and indulges in every sort of counter productive activity along the way. It would just be that much harder a slog. And that's the danger, that the slog can actually become too hard at some point.The quicker it starts to happen, and the more political will that backs it, the easier it will be. Plus, you would have room to make a few mistakes. Anybody who's ever done anything from scratch knows about making mistakes before they perfected what they envisioned. I may not think the warnings about a stock market crash that is imminent are all that merited, but neither do I think that the reasons cited for that fear are all that erroneous. Furthermore, many of them have some crippling element of self-fulfilling prophecy about them. There is a real chance that the fears expressed on this thread could materialize, sometime over the next decade. Shale oil may not hold out over the period of obstinacy. We could become mired in the next series of conflicts in the Middle East. There could be a struggle for investment money between the US and China, or Europe. I'm pretty sure that if they do folks then will concentrate upon the six months or year prior to then and blather on about the indicators and what could have been done differently with interest rate policy or whatever. They likely won't consider that it began now. evilgenius wrote: But does this gradual change mean that the markets will respond with the initiative to build the infrastructure necessary to thrive in the electric paradigm, or will it propel us into a sort of quasi third world situation? Progress is uneven. In '08 Obama set a goal of 1 million EVs by 2015, didn't happen until last year— just in time for trump to call for the end of EV subsidies to makers. Seems like there has been a small inflection, almost 400k EVs of all types were sold last year. It's a drop in the bucket, prices are still way too high for the average driver, and PEVs are just a fraction of that total. Still, as you and I both know, the year po.com went live Bush and Chrysler had just won a suit against the CARBs ZEV mandate, the EV1s were all being crushed, and Who Killed The Electric Car was about to be released. I had no hopes anything would happen but PV cell prices fell by 80% and PV/Wind is cheaper than even full cycle natural gas peakers now. Thats a good thing. On the flip side is what we will face when LTO goes into decline. Rocdoc always tells me that the drillers don't care about decline rates because he guess there will be a long tail to those wells... Thing is I'm not a driller, LOL. Way back I speculated that fracking will be seen in retrospect as doing more harm than good because it masked the conventional peak that is the bread and butter of production. Worse, it also masks the price signal that consumers and the markets need to adapt. I jiggered this up in 2013 from where I don't remember. The peak is higher and maybe farther out... '25? But the only thing that means is the underlying conventional will have declined even further, giving us farther to fall in a rapid decline. Yep. And if we are still relying upon hybrids past a certain point, we will be just as compelled to go to war as if we had no electric initiative at all. Then, the electric future could get lost in nationalism and more counter productive attitudes, like how consuming gasoline is an American right, or, somehow, the American way. Right now, America can still lead. On the flip side is what we will face when LTO goes into decline. Rocdoc always tells me that the drillers don't care about decline rates because he guess there will be a long tail to those wells... Thing is I'm not a driller, LOL. well first off a bit of terminology correction...a driller is the guy on the rig making the drill pipe turn to the right, kicking the rig hands backsides and telling the drilling manager to F&^% off whenever he talks to him on the phone. The wells are planned, completed, tied in by scientists and engineers. More importantly, the long tail is not a "guess", not sure how you thought it was from my previous explanations. The production of oil and gas from tight reservoirs like shale is predictable through theory, Terry Engleder gave a number of presentations about that back a decade ago and Roberto Aguillera spoke to it at length in his book on Engineering of Fractured reservoirs. The initial production is high and then declines at a very high rate as the major fractures connected to the borehole are drained. At some point in time, there is a balance between the rate at which the microfractures which have been induced are replenished from the matrix and in turn replenish the borehole...rate of production equaling the rate by which replenishment happens. This has been well documented in producing fields that have had 4 years or more of production. The rate that these wells stabilize at is relatively low in comparison to the IP but my point here a number of times has been if you have 2000 wells producing at 50 bbls/d that's 100,000 bbls/day and there are a lot of wells out there. Regardless of the theory, here is what is actually happening Roc. Declines are increasing in the both the first and second year and likely the third as well. I'm not saying production from LTO will go to zero overnight. Rather it will fall to some fraction of its total much quicker than most expect. And, just eyeballing my jiggerd decline rate angles, we are already seeing increasing declines as the "sweet spots" are tapped. I have no idea when that might be, Dennis thinks another 5 years and he seems to rely mostly on published numbers not hype. 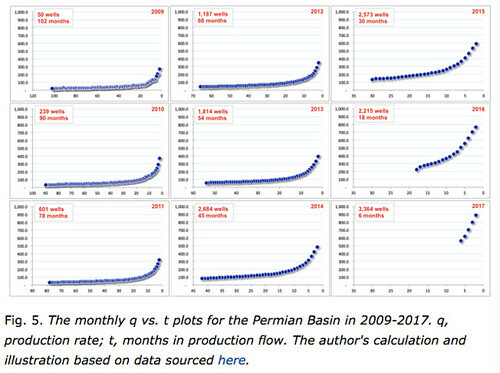 Hardly just theory...I showed plots from up to 2000 well production profiles from the Permian illustrating the production profile. As to decline rate the newer wells drilled are incorporating longer horizontal sections and more fracs which results in higher IP. What goes along with higher IP is higher decline rate as the reservoir and wellbore storage is still limited but also higher base rates once the well stabilizes into low rate decline. That low rate later stage decline is shown in the chart you posted if you look and that is what contributes to base rate. For some reason, a lot of people on this site are wanting to treat unconventional reservoir production like conventional where there is a single decline to ultimate EUR. They aren't the same as is shown in my plots from the Permian. rockdoc123 wrote: As to decline rate the newer wells drilled are incorporating longer horizontal sections and more fracs which results in higher IP. What goes along with higher IP is higher decline rate as the reservoir and wellbore storage is still limited but also higher base rates once the well stabilizes into low rate decline. High initial production then steep drop to a long low tail. My interpretation is this is a problem in that there are only so many good spots and when they are gone production rapidly declines to that "base rate." Here is the question, how long will the base rate last? could be modeled as it depends on the EOR of the individual wells. 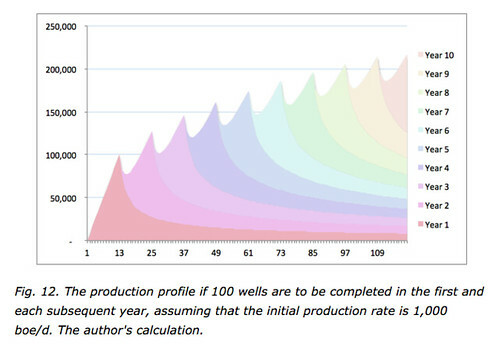 If you have a 150,000 bbls remaining in a well and you are producing at 50 bbls/d thats 8 years for that well. 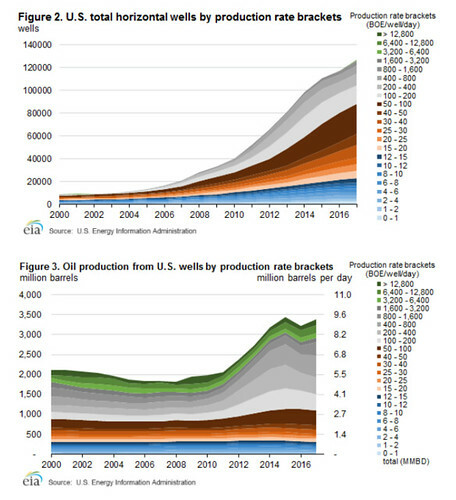 The point is that when the base layer stacks up then the number of new wells one has to drill to maintain production is fewer. The shale reserves are potentially very large if recovery factors can be improved (and they gradually have improved over the past few years). If those 40,000 wells currently producing over 100 bbls/d decline to 100 bbls/d we now have ~ 7 MMbbls/d after the steep declines with no additional drilling. 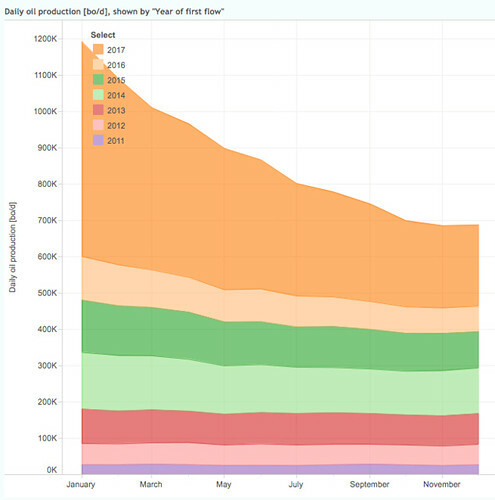 I'm not saying that unconventional production from the tight reservoirs hasn't peaked (we won't know for sometime) what I'm saying is it isn't going to drop off a cliff due to the initial steep declines these reservoirs experience. As I said before (having been there in the executive discussions at one intermediate company focussed on shales in N.Am.) the whole reason companies got into the play is for the long flat predictable part of the production curve. They often referred to it as a "brick" of production that was low risk and fairly predictable. A bit like playing the stock market with a big chunk of your money but still putting a bunch of it into a mattress. In fact, for the bottom 50%, it's just the opposite. Piketty, Saez and Zucman (PSZ) have walked that image back. Don't forget the total wealth pie is now some four times larger then it was in 1980 so your slice did not get smaller by the one percenters getting bigger. In fact the actions of the one percenters caused the growth in the pie making that possible. But if the wealth of the one percenters chaps your cheeks remember for them to enjoy it they (or their descendants) have to spend it, and we ninety nine percenters don't have to be bashful about charging them good stiff fees for what they want. Doomers and liberals in general believe the pie size never changes. Thanks for pointing that out VT. The size of the pie (income or net worth) has increased. The inequality issue is the size of the relative slices of the pie. marmico wrote: The size of the pie (income or net worth) has increased. The inequality issue is the size of the relative slices of the pie. If your slice is sufficient for your needs and growing does it matter that someone else has a bigger slice? The socialist rant is that the rich have stolen their excessive wealth from the poor and ought to have it confiscated from them and redistributed to the poor. While there are some rich people that have acquired their wealth by unethical or illegal means and need to face the law, the vast majority have gained their slice of the pie by hard work and innovation that has benefited us all. Give the socialist their way and they will not bother to sort out good from bad and confiscate it all and in the end stop all growth of wealth including that bit you have managed to add to your slice of the pie. vtsnowedin wrote: While there are some rich people that have acquired their wealth by unethical or illegal means and need to face the law, the vast majority have gained their slice of the pie by hard work and innovation that has benefited us all. The sad thing is that idea is what will take us all the way to plutocracy. I'd post some facts and links but it would be a waste of time. rockdoc123 wrote: I'm not saying that unconventional production from the tight reservoirs hasn't peaked (we won't know for sometime) what I'm saying is it isn't going to drop off a cliff due to the initial steep declines these reservoirs experience. I can see that if the number of producing wells increase for a long period, and the tails last for a an equally long time, the percent of production from the new wells will get continuously smaller. So even a abrupt halt of new production would be a smaller effect. I guess I just don't have an idea what those numbers might be. Remember, I'm a consumer, not a producer, I don't care what the rational is for them, I'm concerned about the price for me. While the rich can buy airtime to get their free speech heard by a lot more people then we peasants can reach that does not tell them what to say or make any of us voters agree with them. But yes the rich do have an inordinate amount of the political power in the US but fortunately it is in their interest to keep the country free and prosperous so they can live the lifestyle they enjoy without constantly being safeguarded by private armies and that prosperity gives the rest of us as good a deal as anywhere in the world at anytime past or present. We have to stay vigilant of course as the greedy will always want more then they deserve. The present push to do away with the electoral collage being a prime example. Right you are, Pops. It's not illegal to lobby for changes in the law that institute a leveraged position in favor of a privileged party. The best example is how Republicans have systematically undermined labor's position. Now, instead of employees, we have independent contractors. Much like how Trump's supporters have gone down the rabbit hole with him and can't see his mental degeneration, those who boast about the disenfranchisement of labor are mostly sycophants who are incapable of empathy toward those who aren't privileged. They can't see that they aren't fighting over rights, but over privilege. They act intellectually as if their loss of privilege would be akin to a loss of rights. It's easy for them to cite the pie getting bigger and the sheer numbers involved in smaller slices for those without privilege. Compared to some measure of decades past, those numbers look really large. And they've become lost when they try and see those kinds of numbers in terms of today's reality. They have no idea how far in a bigger pie universe those smaller slices will go. It's not hard for them. The inability of today's workers to save, for instance, doesn't touch their incomes. Things like that have ceased to bring economic consequences, owing to the amount that foreign investment makes up. Really, the best cartoon of the state of America would depict the one percent as the eight hundred pound couch bound parent of a starving household dedicated to feeding them. Whenever the children are too weak to bring the next slice of pizza it doesn't matter, the parent is sitting by an open window. They have a neighbor who drops by and supplies the necessary food at such times. The cartoon would best depict the neighbor as having a dangerous Butch Cavendish look about them, with a lustful eye kept upon the children. What makes the eight hundred pound parent so alluring, beyond the fact it is the parent and the children are its children, is that it is always pregnant with more children. The children work themselves to death competing with each other, and against those who are yet unborn. The country doesn't need the children to band together and overthrow their mother. What good would that do them? Part of the thing that drives this is the knowledge that overthrow would lead to death as well. The country needs the mother to get it together. Two years later you guys are still whining about Hillary losing. evilgenius wrote: Right you are, Pops. It's not illegal to lobby for changes in the law that institute a leveraged position in favor of a privileged party. The best example is how Republicans have systematically undermined labor's position. Now, instead of employees, we have independent contractors. The move to independent contractors replacing employees is at least fifteen years old and can hardly be blamed on Trump of the Republicans. The real culprit is rapidly rising health insurance premiums making the independents a cheaper source of skilled labor.